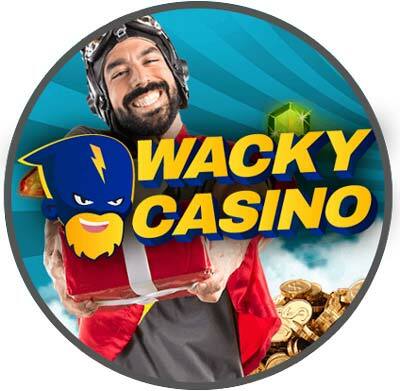 WackyCasino is a new online casino from 2019 and it is also the latest casino that the Viking has reviewed. In his own words, we will bring you information on this casino. We will be looking at Wacky Casinos bonus offers, VIP program, support and payment, and the games they have to offer players. Before reading the rest of the review it is worth noting that both the UK Gambling Commission and the Government of Gibraltar licence and regulate this casino. This means its doors are open to players in the UK and most other countries around the world. WackyCasino does also support mobile and tablet devices but it is only through their website and not an app. We will jump straight into the welcome bonus as it is the one players are most interested in. At Wacky Casino the welcome bonus is a percentage bonus and free spins. This means you will get a percentage of your first deposit as bonus funds along with free spins on a preselected slot. This gives players the chance to try different games and have fun before they have to use their own funds which is always great. After that, there are other promotions you can claim including percentage bonuses and more free spin offers. Wacky Casino also rewards loyal players with their VIP program. As with most VIP programs it offers better perks and rewards based on your rank. Once you have climbed to the top you can expect rewards like express withdrawals, VIP only bonus offers, and VIP table limits to name a few. There are to main sections of games at Wacky Casino the live casino section which contains live game lobbies of blackjack, baccarat, poker, and the fan favorite Dream Catcher. These offer player an authentic casino experience where you can interact with other player and the dealer or host. The other part of Wacky Casinos games is the games section. This part contains the categories of slots and jackpots. The best part of this section is you can filter the games by the provider and what a list of providers they have. You can find games from Bally Wulff, Pragmatic Play, ISoftbet, Skillzzgaming, Gaming Realm, and a lot more. In fact, at the time of writing this Wacky Casino has over 300+ games to keep the player entertained. The support at WackyCasino is really well done as they offer players three different way to contact them. You have options to contact a member of the support team by telephone, live chat, and email. They also provide an FAQ for users to search before contacting a member of support. The payment options are just as well versed as the support options. You will find a whole page of banking information. The page tells us they accept VISA, MasterCard, Paysafecard, PayPal, Apple Pay, and more. The web page also contains all the terms and conditions for each method. The Viking loves nothing more than bringing his readers great new casinos for them to try and that’s exactly what we have here. Wacky Casino is a user-friendly and light-hearted casino that will keep player wanting to come back day after day. So if you have been waiting for a fun and wacky casino then wait no longer. Just click the link and set sail to WackyCasino.